Meet Knitbone Pepper and his ghostly animal friends! Come and meet Knitbone and his ghostly friends! Many of us have a special pet we love, but Winnie Pepper has a different kind of special pet. 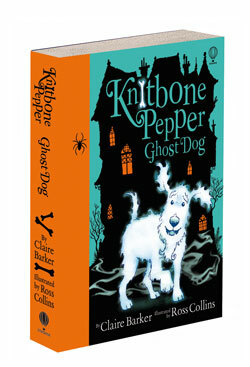 She has a ghost pet; a biscuit-loving ghost dog called Knitbone Pepper! 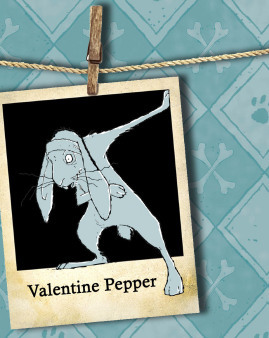 Knitbone Pepper is the first book in a brand new series, and it’s packed with mayhem, chuckles and woofs! Knitbone and a gaggle of other ghostly family pets, haunt the crumbling Starcross Hall, where Winnie and her mad Parents, Lord and Lady Pepper live. This book is written by Claire Barker and illustrated by Ross Collins. Ross wrote ‘The Elephantom’ which has been adapted into a play by London’s Royal National Theatre! 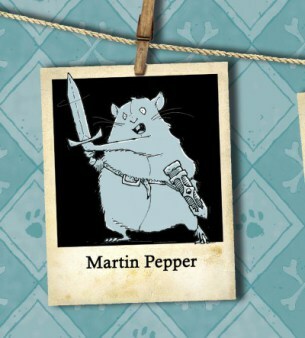 To help you get ready for the release of the book, meet the characters here! Knitbone and his friends are known as beloveds! The Good Ghost Guide explains what that means. Knitbone Pepper is Winnie’s Beloved. He is a mongrel and died of old age. He loves chasing squirrels, adoring Winnie, barking, doing sums and his favourite toy is a rabbit called Floppy Bernard. Knitbone is extremely loyal, and also extremely clever. Died 1192, in a jousting tournament (sitting on his knight’s lap!). Valentine is very proud, quite vain and a little bit haughty at times. He loves doing gymnastics… and admiring his own ears. 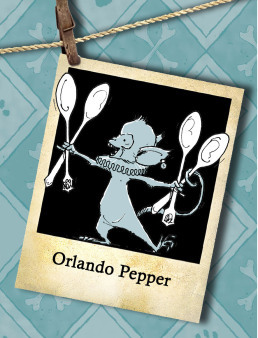 Orlando is a mischievous Spanish monkey, who loves nothing better than spoons. Any shape, and size, anywhere. 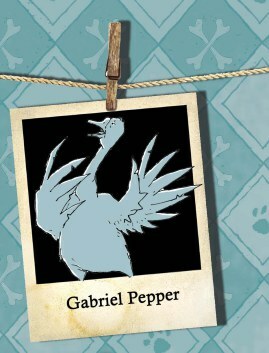 Gabriel Pepper – Goose, Cavalier. Died 1645 trying to defend Starcross Library from the Roundhead army. Gabriel is the patriarch of S.O.S. and is the voice of reason amongst the group. He loves reading and can often be found in the Starcross library. He enjoys being organised (and a little bit bossy). Fell victim to a dodgy Scotch egg at VE celebrations in 1945. He also likes fighting and being generally ready for action. 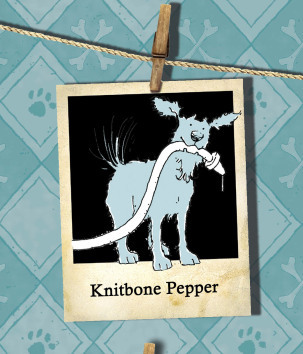 Knitbone Pepper: Ghost Dog is out now. Click here to find out more!